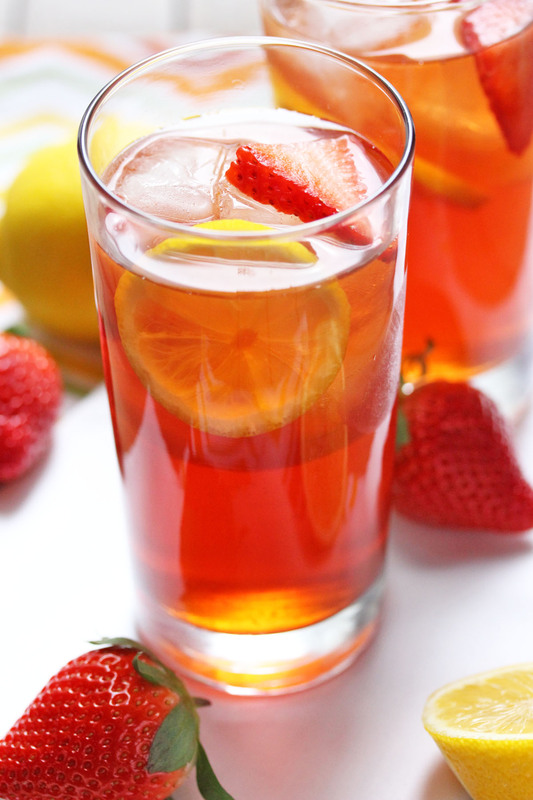 Let’s toast to springtime with some strawberry lemon iced tea! In keeping with the toasting spirit for another moment I would like announce that AMK turned 2!! It is amazing to know that it has been two whole years since my very first post! A big thank you to my readers, fellow food bloggers, family, and friends! For stopping by, trying out some recipes and leaving lots of wonderful comments. It means so very much to me, thank you! Now lets talk tea shall we? If you love sipping fruity flavored iced tea like I do then this is the recipe for you. Just look at that beautiful reddish hue, compliments of lots of fresh strawberries! I used my favorite black tea for this recipe but green tea would also work well. 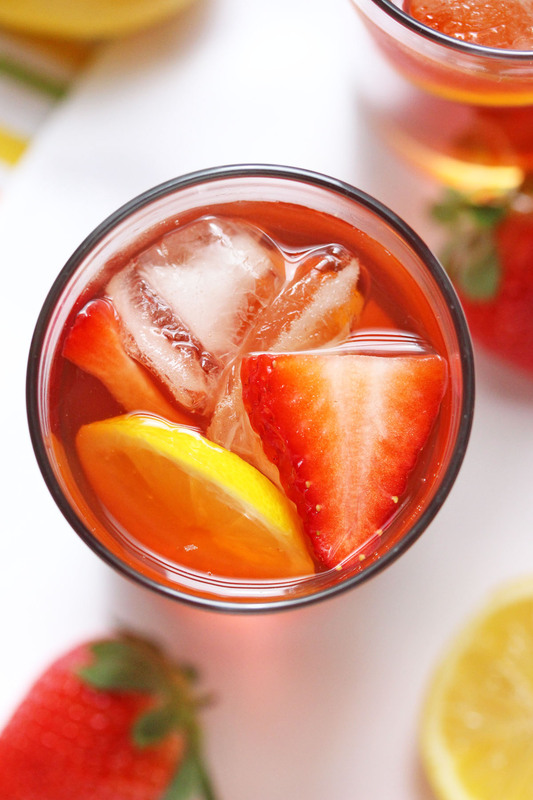 I like to serve up a large glass of tea with plenty of ice, adding a few tablespoons of the strawberry lemon simple syrup to desired sweetness and garnishing with a few slices of strawberries and lemon. You can serve up the tea and strawberry lemon simple syrup mixed together in a large pitcher as well. This tea will be perfect to bring along to picnics, barbecues and all the other warm weather gatherings that lie ahead. In a medium sauce pan, stir together the granulated sugar, water, strawberries, lemon juice, and lemon zest. Bringing the mixture to a boil. Once the mixture is boiling reduce the heat and using a wooden spoon stir and gently crush up the strawberries to help them release more of their flavor. Continue simmering until the sugar is dissolved and the syrup has slightly thickened. About 10 minutes. Carefully strain the strawberry mixture using a fine mesh sieve over a large heat safe bowl or large glass measuring cup. Discard the strawberries. Allow the syrup to cool. Once the syrup has cooled you can transfer it to a bottle or container with a tight fitting lid and refrigerate until chilled. *Note: I start the simple syrup first so it has plenty of time to cool. Bring 6 cups of water to a boil in a large sauce pan. Once boiling remove from the heat and add the tea bags steeping for 5 minutes. Remove the tea bags and discard. Allow the tea to cool. Once the tea has cooled place it into a pourable container with a tight filling lid and refrigerate until chilled. Fill a glass with ice add some chilled tea and a few tablespoons of the strawberry lemon syrup or to desired sweetness. Give it a quick stir to combine. Garnish with sliced strawberries and lemon and enjoy!